We use the Springfox Java library to create a Swagger documentation. The result can be displayed in a graphical user-interface, which allows one to explore all the information about each resource and applicable parameters. Every available resource (e.g. from a simple /area to /count/ratio/groupBy/boundary) can be inspected and tested within this Swagger-UI. Additionally, you have the option to download the result data directly as a JSON file via a button within the response window. You can try out a first ohsome showcase prototype dashboard that uses data from Nepal. 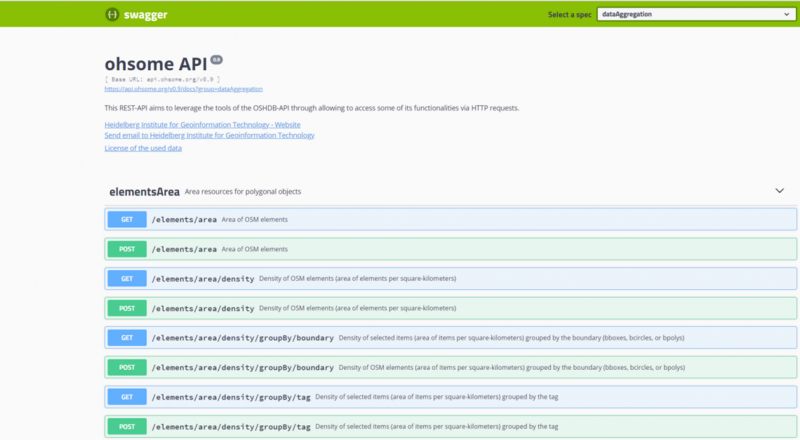 In general, the Swagger documentation should provide you with the needed information to fire some requests against our API and explore the underlying OSM history data. If not, or if you have other suggestions/ideas, please send us an email to info@heigit.org. We appreciate any feedback and comments.